Animonda GranCarno Original Adult is balanced, tasty and healthy wet food for adult dogs. The wet food contains 100% fresh ingredients and real pieces of meat. 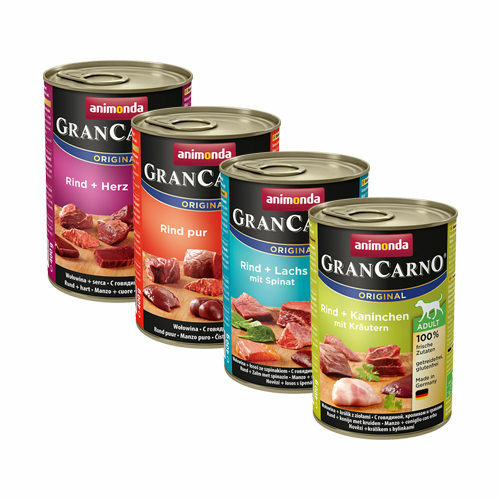 GranCarno Original Adult from Animonda is tasty wet food that consists of real pieces of fresh meat; a true feast for your beloved dog! The wet food contains 100% fresh ingredients and offers adult dogs all the necessary nutrition they need. The food does not contain any grains or soy. Animonda GranCarno Original Adult - Beef with Heart: 52% beef meat (meat, lung, liver, kidney, udder), 16% heart and calcium carbonate. Animonda GranCarno Original Adult - Beef with Chicken: 38% beef meat (lung, liver, meat, heart, kidney, udder), 30% chicken (meat, heart, liver) and calcium carbonate. Animonda GranCarno Original Adult - Beef with Lamb: 53% beef meat (meat, heart, liver, kidney, udder), 15% lamb (lung, liver) and calcium carbonate. Animonda GranCarno Original Adult - Beef with Turkey: 53% beef meat (lung, meat, kidneys, heart, udder) and 15% turkey (liver, heart, stomach, throat). Animonda GranCarno Original Adult - Beef: 68% beef meat (meat, heart, kidney, lung, liver, udder) and calcium carbonate. Animonda GranCarno Original Adult - Beef with Game: 50% beef meet (lung, meat, heart, liver, kidney), 18% game (meat, liver) and calcium carbonate. Animonda GranCarno Original Adult - Beef with Duck: 40% beef meat (lung, meat, liver, heart, kidney, udder), 14% turkey (meat, heart, liver) and 14% duck (heart, throat). Animonda GranCarno Original Adult - Beef with Venison and Apple: 47% beef meat (meat, lungs, liver, udder, kidneys, heart), 15% venison, 6% apples and calcium carbonate. Animonda GranCarno Original Adult - Beef with Salmon and Spinach: 45% beef meat (heart, lungs, liver, meat, udder), 20% salmon, 4% spinach and calcium carbonate. Animonda GranCarno Original Adult - Beef with Eel and Potato: 40% beef meat (lung, heart, liver, meat, udder), 22% smoked eel, 6% potatoes and calcium carbonate. Animonda GranCarno Original Adult - Beef with Rabbit and Herbs: 40% beef meat (lung, meat, heart, liver, kidney), 14% chicken (meat, stomach, throat), 13.5% rabbit meat and 0.5% parsley. Have you used Animonda GranCarno Original Adult before? Let us know what you think about this product.